Akihabara is an area that is being transformed from a small centre with hundreds of small or tiny shops into a place that has tall buildings with large corporations controlling the area. While it is true that things are changing, you can still see some of the craziness and the strangeness of this area if you know where to look. For those wanting to see anime, anime figures, manga, and toys, heading to the northern area, near Suehirocho Station is your best bet. There are several shops in the area that sell these goods. 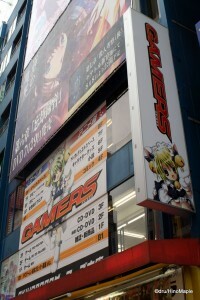 There are also several located throughout the Akihabara area. The most famous style of shop is the “glass” shop. This shop can range in size. It can be as small as a single room, to one occupying an entire building. When you enter the shop, you will be met with various glass boxes. Inside each box, there are various figures on display. You can buy anything that is located within theses boxes, unless they are for display only. The key is to find out which box the stuff you want is in, and ask one of the staff to help you. The interesting part of this is that while you might think of this as a stand alone shop, it isn’t. Each glass box is usually a different shop. Many people will rent out one of the boxes to either display their goods, or to sell their goods. It can range from internet companies needing a physical location for some of their items, to regular people wanting to make a few bucks with the stuff they have collected over the years. It is a very different concept to the traditional shop that is common in almost every other area of the world. Another thing to look for in Akihabara is the vending machines. Due to the nature of the area, vending machines are very prevalent. In every corner, on every street, you will be able to find a vending machine. While this is also true of most areas of Tokyo, it is special in Akihabara. They specialize in unique vending machines. The standard machines that sell drinks of all types are, of course, common, but they also have machines that sell food. You can buy hot noodles in a can. These can be very popular, and it even comes with its own plastic fork. 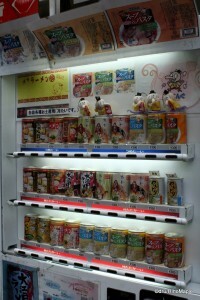 You could also purchase Oden, which is various vegetables in a broth. I would liken it to a stew, but it’s very different in taste. Oden is typically found in convenience stores, but there are restaurants that specialize in it as well. Meat is not typically found, aside from sausages. While less common, spaghetti can be found, and it is very possible to find anime drinks. These tend to be your average drink, but with an anime character on the cover. Do be aware that prices can be jacked up, depending on where you are and what you buy. Maids are an Akihabara specialty. When you exit the station on the east side, and all along Chuo-dori, you are more than likely to run into several maids, especially on the weekend. If you venture to the east side of Chuo-dori, you will find a lot of different maids looking to take you to their shop. This is a relatively recent trend that has changed since I first visited. When I first came, maid cafes were starting to become very popular. You would see various Japanese women, sometimes European as well, dressed in a French style maid outfit. They would almost cry to get you into their café. It was all part of their act. Today, you can find the strangest fetishes regarding maids. The typical maid café charges a sitting fee on top of a mandatory drink. One drink is usually good for about 1 hour. This may change depending on the café. You are then treated to a dose of acting from all of the maids in the café. They tend to talk to you as if you are their master, at all times. They act very cutesy and they play games with you. Sometimes, there is a stage where they will play games with the entire café. If you want to have a picture with one of the maids, or play a private game at your table, you will have to pay extra. You can even buy one of the maid outfits if you really wanted to. The man target for this is the men, not the women. Today, they have added a plethora of different theme cafes. This can range from a maid café where men dress as maids, but it’s relatively the same thing. You can also see cafes where the girls are dressed more like a school girl, or even a moody school girl that will treat you like dirt, but cry and apologize when you leave. I have seen various maid style cafes on TV, but I have never personally been to one. I have seen their prices and can’t imagine entering one based on the prices. If you really want to check it out, go ahead, but be sure you know how much it costs. It could be as much as 4000 Yen for just one hour. The safest place to visit a maid café might be on top of Don Quijote. When I first came to Japan, Akihabara was only half as busy, but twice as strange. In the last few years, the Mayor of Taito-ku, the name of the district Akihabara lies in, decided to clamp down on the strange people. 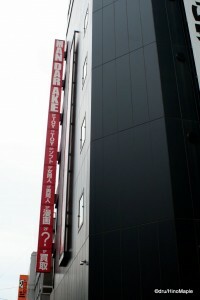 Several new buildings have popped up to act as an IT hub for Tokyo, and the police have done everything in their power to stop any performance that is done on the street. While there is a good reason for this, they have decided that Akihabara’s original character of craziness has to go, and that it’s better to be a boring town like every other district of Tokyo. On the weekends, you might be able to see a couple of “crazy” performers. They tend to be men, and they tend to dress up as female anime characters. Nowadays, they probably just walk around. If they stop, the police will probably talk to them. If they play loud music, the police will move them along. If they dance to the music, the police will arrest them. While this may seem strange and a little heavy handed, there is a main reason to this. In the last couple years, some girls began to dress as maids, or other characters with a very short skirt; stand on a railing, and let people take pictures of them. In essence, they let dirty men take photos up their skirts. Thankfully, this has pretty much stopped, but the days when a tourist could walk along Chuo-dori, see someone dancing, take pictures, and say Tokyo is strange is long gone. If you came to Akihabara looking for cheap electronics and hundreds of little shops, you will be disappointed. If you came looking for a cool subculture, you will find something, but probably not exactly what you were looking for. Either way, I still recommend visiting Akihabara. 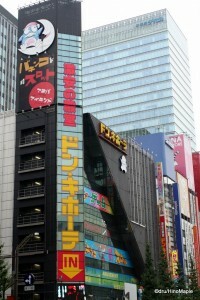 The Akihabara series continues with Akihabara – For the Civilized and Akihabara – Redux. This entry was posted in Tokyo and tagged Akiba, Akihabara, anime, anime figures, Don Quijote, Donki, French maid, japan, maid, maid cafe, manga, oden, ramen, school girl, Sehirocho Station, shopping, soba, spaghetti, Taito, Taito-ku, tokyo, Tokyo-to, toys, udon, vending machine, おでん, アキバ, アニメ, ドンキホーテ, ラーメン, 台東区, 施肥炉著駅, 日本, 東京, 東京都, 秋葉原, 秋葉原駅, 自販機 by Dru. Bookmark the permalink.